These are fiddly, and produce a lot of mess that needs cleaning up, and you need to have a lot of equipment and know what you’re doing, but they do taste really great. Pre-heat oven to 180C, 375F, Gas 5. With a wooden spoon, cream 4 ounces of butter with 4 ounces of vanilla sugar, until fluffy. Add an egg yolk and a big tablespoon of marmelade, or orange-flower jam. Cream some more. 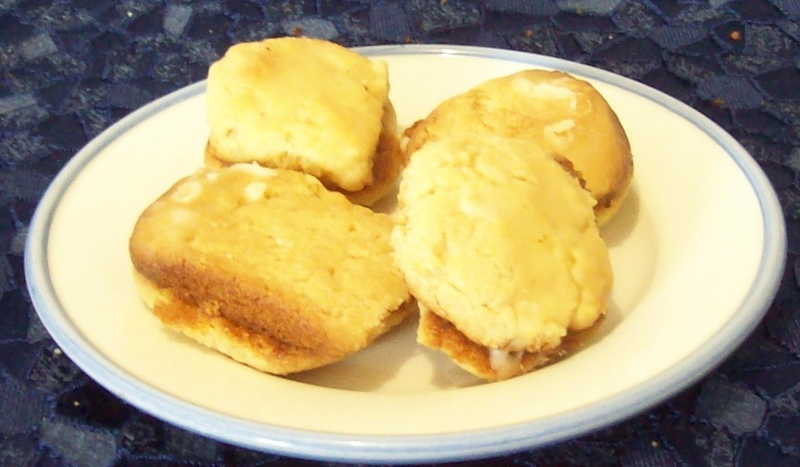 With a metal spoon, fold in 6 ounces of SR flour and 1 ounce of semolina. It will form a kind of dough. With clean floured hands, roll this dough into an even number of balls, each about the size of a marble — that means a diameter of a bit over a centimetre. It doesn’t matter if they vary in size as long as you have two of each size, so I have found that the best way to do this is take a double amount and split it, so you are always making two balls of the same size. This also helps with making an even number. It ought to make about 24. Bake for 20 minutes. When you take them out they should be browned on the bottom and still pale on the top. Remove from tray with a palette knife, cool on cooling rack. While they are cooling, take the juice of an especially delicious and juicy orange, and add 6 ounces of icing sugar, stirring it in to make a glaze. Put the tray, or another tray, under the cooling rack. Then dip the double cookie in the glaze — holding it squeezed in your fingers, dip the side you’re not holding. Put it back on the cooling rack to drip onto the tray. Do this with all the cookies, until you have done it with all of them. Then take the remaining glaze and pour a little of it on the top of each cookie. Leave for about an hour to harden and cool. They’re great, very orangey and very sweet, and everyone asks why you don’t make them more often.